This article has been taken from the book “Arabian Antiquities of Spain” by Murphy, James Cavanah, 1760-1814 ,published in 1816. The text has been converted from scanned images using OCR software and may contain grammatical errors. This noble specimen of Arabian Architecture was begun by Abdurrahman I. and finished by his son and successor, Hisham ; subsequent khalifs of Cordova, enlarged the building as often as the increase of population required, until it assumed the general form in which it now appears. * The mosque is of a quadrangular form, six hundred and twenty feet in length from north to south, and four hundred and forty feet in breadth from east to west; it was originally surrounded by four streets, which were designed to prevent any other building from coming in contact with it. Of the twenty-one doors, which it is said to have originally had, five only are now remaining; they were all covered with brass plates of most delicate workmanship. Of the six hundred and twenty feet, which compose the length of the mosque, two hundred and ten were appropriated on the north side, to the formation of a court, communicating by means of a gate of modern erection, and known by the appellation of the Gait of Pardon. Nineteen aisles, each of about three hundred and fifty feet in length, by fourteen feet in breadth, run parallel from north to south through the interior of the edifice; and a similar number, not quite so broad, extends from east to west. These aisles are formed by an immense number of columns, the arrangement of which produces a most striking effect that must have been still more magnificent, before the building underwent any alterations. PLATE II. PLAN OF THE MOSQUE OF CORDOVA IN ITS PRESENT STATE. AFTER the conquest of Cordova in 1236, St. Ferdinand converted this mosque into a cathedral; and it preserved its ancient plan until the time of the Emperor Charles V. In the year 1528, the Spaniards began to disfigure its symmetry by modern erections, which continued to be made in succeeding reigns, in order to convert, it more effectually into a temple for celebrating the solemn rites of the Christian religion; by which injudicious scheme both ‘the Moorish and Christian architectures are deprived of everything like unity of design. In vain have remonstrances been repeatedly made at different times, by the lovers of the arts, nay, even by royalty itself, against these misplaced and tasteless alterations. Regardless of these representations , the Chapter of the cathedral have, to the present time, persisted in retrenching from the details of the interior, or in adding others executed in a totally different style. Of this description is the choir, erected in the centre of the whole edifice; and which, as Mr. Swinburne has justly remarked, were it in any other church, would deserve great praise for the Gothic grandeur of the plan, the loftiness of its dome, the exquisite carving of the stalls, and the elegance and high finishing of the arches and ornaments. But, placed as it is in the middle of the Arabian structure, it destroys all unity of design; darkens the rest; and renders confused every idea of the original general effect of the building. Many are the chapels, erected in various parts between the pillars; which indeed form so many distinct churches in the midst of the old cathedral, interrupt the enfilade, and block up the passage. In one place, columns have been removed, in order to adorn these same chapels: in another, we are credibly informed, pieces of the beautiful timber-work, that supports the roof, have been taken away for the purpose of making musical instruments, especially guitars, for which use this kind of wood has been recommended, as being pecu¬liarly proper!!! It may readily be conceived, how such vile spoliations as these, repeated too for successive centuries, must have altered the original simplicity of the mosque; yet, notwithstanding all these impediments, the spectator cannot fail to be struck with admiration, on beholding the interior of this magnificent structure, in which the oriental style is every where the prevailing characteristic. No coup-d’oeil, it has justly been remarked, can be more extraordinary than that taken in by the eye, when placed in such parts of the church as afford a clear view down the aisles at right angles, uninterrupted by chapels and modern erections. Equally wonderful is the appearance, when the spectator looks from the points, which present to him all the rows of columns and arches in an oblique line. As the preceding Plate exhibited a view of the mosque, such as it was planned by Abdurrahman I., who was fortunate enough to meet with an architect capable of carrying his sublime ideas into execution, it may not be displeasing to the lovers of the Arts, to have another plan of the same edifice, in which its various additions and alterations are delineated. PLATE III. ELEVATION OF THE MOSQUE AT CORDOVA. EACH of the four fronts of this beautiful edifice, exhibits low walls, remarkable for their solidity, all of which are crowned with crenated battlements. Each of these fronts, however, differs from the other, by its height and ornaments. Our view presents a correct elevation of the building: the massive structure of the walls, and the crescent or horse-shoe form of the arch, which mark the first of the three periods into which the Moorish architecture is divided, are here seen to considerable advantage; while the solidity of the whole is relieved by the light appearance imparted by the battlements. PLATE IV. A view in the garden belonging to the Mosque at Cordova. The garden, attached to the mosque, occupies an inclosure of about two hundred and ten feet in front of the building, nearly one-fourth of the entire space appropriated to it. fountains, with which theMoslems anciently performed their ablutions, as well as by the delightful shade afforded by a great number of cypress, palm, and orange trees. It is, in fact, a kind of garden in the air, raised over a vast cistern. Four or five feet of earth suffice for the support and growth of those beautiful trees; among which, there are numerous orange trees, from thirty-five to forty feet in height, and palm trees, sixty feet high. In the centre of this perpetual verdure, and in front of the mosque itself, which forms the fourth or northern face of the garden, stands a square tower, containing numerous windows, and terminated by a cupola or rotunda. It serves as a steeple. All the apertures in this kind of cloister are erected in the Roman style of architecture, and are ornamented with upwards of one hundred columns. This garden is the most agreeable promenade of Cordova: its principal gate, termed the Gale of Pardon, is of modern construction. PLATE V. A general view of the interior of the Mosque at Cordova. Nothing can be more striking than the view presented to the spectator, on his first entrance into this magnificent temple; which has, not inaptly, been compared to a forest of columns disposed in the form of a quincunx. The principal lines, or features, of its internal distribution, are formed by the thirty eight aisles or naves, delineated in Plate I. and described in page I. An eye, accustomed to the lofty and imposing appearance of our splendid churches, views with surprise the humility of this mosque: for the height, from the floor to the ceiling, is only thirty-five feet. In the language of fiction, the former might be attributed to a race of giants, and the latter to a generation of pigmies: but the same principle of attention to the interior, regardless of the general external appearance, which marks the other Moorish structures, is here distinctly to be observed. While public utility has studiously been provided for, all that was costly and curious has been reserved for the interior: and the mind, upon examination and reflection, remains satisfied with the appearance of strength, convenience, and grand simplicity. The columns at present are about eight hundred and fifty in number; and are formed of granite, porphyry, jasper, and other marbles, exhibiting an assemblage of various and brilliant colours. The whole, taken together, presents a scene so truly unique, that the visitor is at a loss, whether to admire most their number, or their richness: but, from the variety of styles prevailing in the different parts of which these columns are composed, it is evident that they originally belonged to different nations and ages. Many of them were taken from Roman edifices;* which being of various lengths, the Arabian architect supplied the want of a sufficient quan- tity of capitals and bases, by imitating those which were before his eyes. The columns are all nearly of an equal length, being about nine feet between the base and the capital: the thickness of the shaft is pretty equal throughout, being about eighteen inches in diameter. The Capitals were, originally, of the Corinthian order, and were beautifully sculptured, as would appear by the few that are still entire; and such capitals, as were supplied by the Arabian architect, are for the most part imitations of the same order. From these capitals rise arches, which spring from one inter-columniation to another; and, from their crescent, or horse-shoe form, as well as the arabesques, inscriptions, and other embellishments, present an entirely Oriental character. Above the first arch is placed a second, considerably narrower, and connecting it with the square pillars that support the timber-work of the roof, which is not less curious in its execution than the other parts of the building. It was put together in the time of Abdurrahman I., and subsists to this day unimpaired, though partially concealed by the plaster-work of the modern arches. The beams contain many thousands of cubit feet: the bottoms and sides of the cross-beams have been carved and painted of various colours, principally red, and with different figures; the rafters also are painted red. Such parts as retain the paint, are untouched by worms: the other parts, where the paint no longer remains, are so little affected that the decay of a thousand years is scarcely perceptible; and, what is rarely to be seen in an edifice of such antiquity, no cobwebs whatever are to be traced here. The wood employed for the timber-work, is that of the alerce, a species between the cedar and the pine (the Pinus Larix or White Larch, we believe), which is reputed to be incorruptible. The vicinity of Cordova formerly abounded with this kind of trees, a forest of which is said to have stood on the west bank of the Guadalquivir; though not the smallest vestige of it is now to be found. The timber work of the roof is further covered with lead: and the whole has been executed with such precision and taste, that it may justly be pronounced a chef-d’oeuvre of art, both with respect to the arrangement of its different parts, as well as to the extent and solidity of the whole. On a slight inspection of Plate V. it may perhaps strike the observer, that the general effect would have been improved, and the perspective heightened, by the introduction of a little more light from above: but, had such a correction been made, our engraving would not have been a faithful representation of the solemn and majestic interior of the Mosque at Cordova. 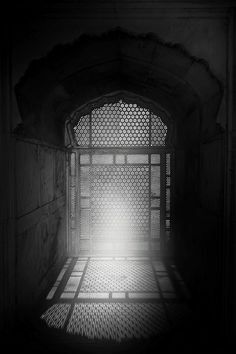 A ” dim, religious light” is admitted into it, by the doors on the sides, and from several small cupolas above; which falls upon some parts of this immense edifice, while others are left in awful darkness. Individuals, walking through this forest of columns may, by an ardent imagination, not unaptly be compared to wandering spirits;—their persons may readily be distinguished, but their footsteps cannot be heard. By the several alterations and additions, which were made at different times by the Spanish Arabs, they had divided the mosque into lour parts, marked out by two lines of clustered pillars, crossing each other at right angles. Three of these portions were allotted to the common people and to the women: the fourth, which was in the south-east angle, was appropriated to the Imams or priests and great men. In this last division was the great Kiblah or Sanctuary, better known by the appellation of the Zancarron, in which the Koran was deposited. Its door was in front of the great gate, at the end of the principal aisle: and the architecture and ornaments of this Sanctuary, as well as the throne of Almansur which faced it, are very different from those employed in the other parts of the edifice; all the skill and taste of the Moors appear to have been lavished on it, in the richest profusion. Two rows of columns, about six feet in height, rise one above another, and support the screen before this Sanctuary. The columns are chiefly of verd antique, or red marble veined with white; the pilasters are of red or white marble; and the capitals are of white marble, gilt in many places. 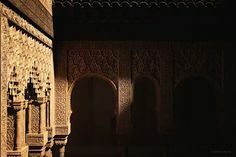 The arabesques and other ornaments of the timber-work of the roof, as well as those of the pilasters, are very fine, and bear a great resemblance to the sculptures in the Alhamra at Granada. The Gate of the Zancarron, of which our plate represents the elevation, is indeed an assemblage of beauties rarely to be equalled. As it very closely resembles the line specimens of Arabian architecture to be seen in Upper Egypt, and is unquestionably in a different style from the rest of the Moorish architecture, it was probably executed in imitation of the palaces at Damascus and Baghdad: it certainly is the finest specimen, in the whole edifice, of the first of the three periods, into which the history of Arabian architecture is divided. This gate is of white marble delicately sculptured, ornarne- mented with numerous columns of precious marble. The arch itself is mosaic, with a blue ground, and the decorations superbly gilt; and its intrados are gold, red, blue, and green mosaics, of singular beauty. Unfortunately, the Arabic inscriptions are at present too much defaced, to be sufficiently legible for the purpose of being transcribed and translated: yet, from their imperfect remains we are justified in stating, that the Cufic characters were distinguished by equal taste and beauty. The two lines, which are at the top and on either side of the arch, are in mosaic on a blue ground with gold letters; and the single line, immediately over the arch, is also in mosaic, on a gold ground with blue letters. The contrast is exceedingly striking in its present comparatively decaying state, and the whole is truly superb: but, when illuminated) (especially on the last ten nights of the month Ramazan) by the massive silver chandelier, which hung down in its centre, the gorgeous beauty of the Zancarron must have surpassed every thing that we can possibly conceive of splendour or magnificence. The interior of this Sanctuary is an octagon, only fifteen feet in diameter, into which the light is with difficulty admitted ; its walls are covered with ornaments nearly similar to those above described: and the cupola is composed of a single block of marble, said to be eighteen feet in width; which, as Mr. Swinburne has justly remarked, is not only curious for its size and quality, but also for the ingenuity of the architect, by whom it was placed in such a perfect equilibrium, as to remain unshaken during the lapse of so many ages. The Zancarron is at present a chapel, dedicated to Saint Peter, and formerly belonged to the Dukes of Alba: it contains the tombs of several grandees of that family, and is now the property of the Conde de Oropesa. PLATE VII. exterior angle of the mosque. Each of the four fronts of this noble edifice presents walls of uncommon solidity, crowned with engrailed battlements, and supported by buttresses, which, at a distance, have the appearance of so many towers. Our plate gives a view of the exterior south-west angle of the mosque: the walls are covered with plaster of a greyish colour, which being decayed in some parts, the stone-work becomes apparent; the massive outside pier or buttress, is nine feet and a half in height from the ground to the bottom of the engrailed battlement. Such is the general character of the building; but it is worthy of remark, that each front differs from the other as to its height and ornaments, in consequence of the Arabian architect being obliged to accommodate the structure to the versatile taste of the Arabs, who were passionately fond of variety, and also to the inequalities of the soil; which are so great, that in order to reach the edifice, it becomes necessary to ascend thirty steps on the south side, and on the north side to descend fourteen steps. Between most of the projecting piers or buttresses, doors are placed, which are ornamented with fret-work in stucco, of equally delicate and durable workmanship; that has continued unimpaired, not-withstanding it has been exposed to the injuries of the weather for so many centuries. 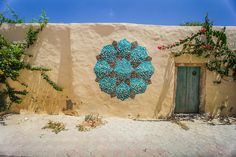 In some of these ornaments, the Arabs have combined with the stucco a kind of mosaic of baked earth, the introduction of which has contributed greatly to consolidate the whole of the fret-work. These ornaments are further painted with various brilliant colours; which must have produced a very striking effect before any alterations were made in the edifice. PLATE VIII. A cufic inscription in the place appropriated to the performance of ablutions, in the mosque at Cordova. PLATE IX. THE BRIDGE OF CORDOVA. Tradition relates, that there formerly was a bridge over the Guadalquivir, erected on the site of the present structure, about two hundred years before the arrival of the Moors in Spain: but, this edifice being greatly decayed, the Arabs built the bridge delineated in our engraving, during the vice-royship or Assamli, A. H. 101—A. D. 720 or 721. This noble structure is four hundred paces, or one thousand feet, in length, at two feet six inches each pace; its breadth is twenty-two feet eight inches within the parapet. The passage over the bridge is a straight line, from one end to the other; the arches are sixteen in number; and the buttresses of the piers are much stronger and better adapted for similar purposes, than the modern trilateral cut-waters. Nearly eleven centuries have these buttresses withstood the rapid floods of the Guadalquivir, without sustaining any material injury.